There are already multiple 3D printer filaments that contain carbon fibers infused with thermoplastics such as the Proto-pasta Carbon PLA filament. These filaments for 3D printers however all rely on chopped carbon fibers and the end result is not as good as what we are used to seeing both visually and in terms of mechanical properties from woven carbon fibers infused with epoxy. A company called MarkForged, founded by an aerospace engineer, however is trying to change all that with their device called Mark One Composite 3D Printer that is designed to print using continuous strands of fibers embedded in a thermoplastic matrix, a process that they call CFF (Composite Filament Fabrication). The Mark One 3D printer is capable of printing carbon fiber, glass fiber and Kevlar composite materials, but these need to be designed especially for the device filaments. According to tests made by MarkForged of their special filaments parts printed on the Mark One can be designed to be stronger than 6061-T6 aluminum by weight and up to 1/3 the strength of the best carbon fiber composites made today. This strength is achieved thanks to the use of continuous fibers as a reinforcement in the printing material as opposed to the use of chopped fibers that Carbon PLA and ABS filaments designed for normal FFF/FDM 3D printers rely upon. Composites made with continuous reinforcing fibers exhibit substantial increases in strength and stiffness compared to similar materials using discontinuous (chopped) fibers. The CFF technology used utilizes a thermoplastic matrix that solidifies immediately after extrusion, so the printed parts are ready for use as soon as they have finished printing. But the Mark One 3D printer apparently can also print using Nylon and PLA thermoplastic materials aside from the composite fiber materials, so you should be able to use the device for more things that do not require strong fiber composites. The Mark One composite 3D printer uses a dual printhead design: one head is capable of printing composite filaments (CFF) and the other, traditional thermoplastic filaments (FFF) and parts may be printed either by a single head or a combination of the two. 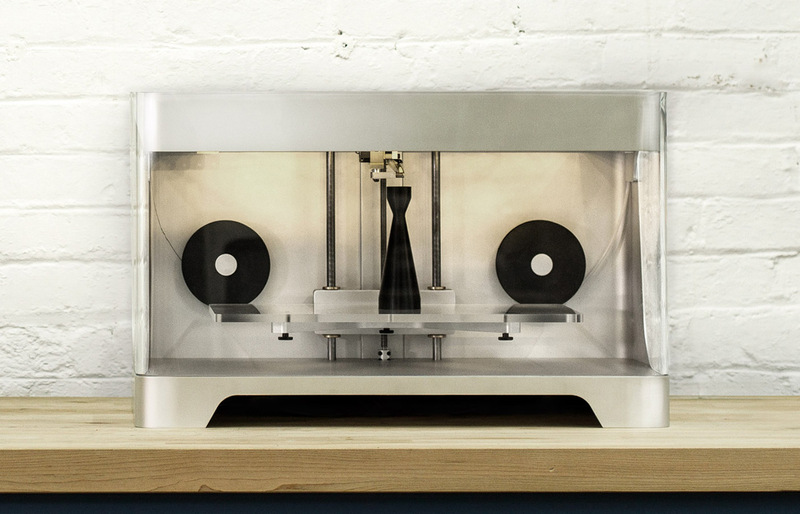 The MarkForged Mark One 3D printer does not come cheap, but it is also a device that is not designed for the average home users – it is apparently targeted at professionals that need to be able to work with stronger fiber reinforced parts that they design and print. You can currently order the Mark One Composite 3D Printer for $5499 USD (dev kit is available at $8799 USD with more materials), but there is approximately 10-12 week lead time. With the device being shipped worldwide, so as long as you need it and are ready to wait a bit for it you should be able to get your hands on this interesting 3D printer. Apart from Nylon you should be able to use cheap PLA filament as well, and as you can see the fiber reinforced special filaments do come pricier with Fiberglass probably the best choice if you need high strength at the best price with Kevlar and Carbon filaments used only when they are specifically required. Unfortunately there is still no option to order filaments on the official website, so you should probably contact the manufacturer to request additional filaments to be shipped with your order of the printer or get the development version instead of the standard one that comes with more materials bundled.